Chandigarh 31st July:- Hometel Chandigarh every time has come forward to introduce new things to the people of the city beautiful. 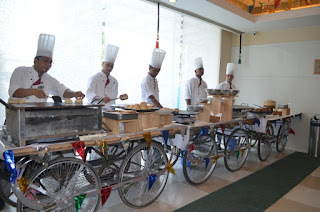 After successful completion of many food promotions such as Kashmiri, Sizzler Food Festival, Kebab & Mango Bahar etc Hometel is again organizing Street Food Festival season 3 from july 29th to august 9th 2015 at FLAVOURS – All Day Dining Restaurant in the evenings between 1900 hrs – 2300 hrs. The street like ambience deftly created by the expert hands in the restaurant and the lounge area lends a perfect match to the sizzling sound of bhaji & tikki. The culinary skills and aromatic flavour of the food suites all the tastes and tongues. Enticing aroma of Bhaji, Bhaturey, Tikki Chaat, Kachori Chaat, Keema Pao, Chicken Dimsums, Paneer Roll, Chicken & Egg Rolls from Delhi, Mumbai, and Kolkata are skillfully prepared by our chefs at Flavours that will keep the spirit of serving the best Street food from all over India. Chef Bidesh and his team at Flavours bring to its patrons variety of street food to choose from. Starting with the Non Vegetarian affair: – Keema Pao, Chicken Egg Roll & Chicken Dim Sims. Vegetarian specialties are Pao Bhaji, Tikki Chaat, Choley Bhature, Golgappe, Paneer Roll & Vegetable Wontons.. Finish your meal with Signature dessert of Street's i.e. Kulfi Falooda & Ice Cream Cone. Hometel invites everybody to be a part of the Great Indian Culinary Fest from 29th July 2015 through 9th August 2015.